Time view in Oracle Field Service Mobility Cloud Service enables you to manage and control the work of several resources at once, using a mobile device. Time view is designed to delegate the responsibilities of a dispatcher, who generally works from the office using Oracle Field Service Core Manage Cloud Service, to a field manager, who works with other resources in the field and uses Oracle Field Service Mobility Cloud Service. Similar to the that of a dispatcher, a field manager’s role is to monitor the activities resources (technicians), track possible jeopardy situations that might take place while on duty, and promptly contact the resources if it becomes necessary. In time view, field managers can easily monitor routes and activities of several other mobile resources along with performing tasks of their own. Field managers can view the list of resources and their routes for several days, check resource status and work load, get information on shifts and work skills, and contact a specific resource or switch to that resource's interface. To access time view in Oracle Field Service Mobility Cloud Service you must have at least two resources assigned to you as a user. Note: Resources are assigned to a user in the Users screen in Oracle Field Service Core Manage Cloud Service. If there are no groups in Oracle Field Service Mobility Cloud Service assigned to you as a user, you will be prompted to create a group after logging in to the application. You will be redirected to the Group Details screen with the corresponding notification displayed. Click Create to start creating a group. If you already have at least one group created, you will get directly to the time view screen after logging in. The time view, or Manage area, allows a dispatcher or field manager to view all resources routes with their activities shown as color-сoded blocks. The functionality allows you to view routes for a single day, as well as access the multi-day view. By default, the time view is scaled with the focus on the current time. However, you also can browse through different dates by scrolling across the screen. Or, alternatively, you can view multiple dates by pinching the screen on your mobile device to zoom in and out. Scrolling up and down allows you to view additional resources. 1 Time indicator: The vertical red line indicates the current time. The time corresponds to the time zone specified in your user settings. 2 Date delimiter: Gray vertical dash lines specify the boundaries between the days. 3 Date indicator: For each day currently displayed in time view, a date indicator displays in the top-left of each day section. The date indicator is shown in the long-date format set for the user. Ordered activities for each resource are represented as color-coded blocks on a resource’s route. The length of the blocks is relative to activity duration (the longer the block, the longer the activity it represents). The activity label shown inside activity blocks is configured in the Activity time view label context in Oracle Field Service Core Manage Cloud Service. The light blue blocks represent travel time to activities as well as the final travel time, if the travel time is foreseen. The length of the blocks is relative to travel duration (the longer the block, the longer the travel time). The white blocks in a route represent idle time of a resource with the idle time duration shown inside. Note: Idle time is not always explicitly shown in time view. If its duration is less than the minimal preset value ( Idle time minimal), the idle time will show as gaps in a route rather than distinct blocks. You can define the Idle time minimal on the Display screen in Oracle Field Service Core Manage Cloud Service. The yellow arrows on the route indicate the time of route activation (a right-headed arrow or the first of the two consequent right-headed arrows), reactivation (the second of the two consequent right-headed arrows, if applicable), or deactivation (a left-headed arrow). The white (not shaded) area represents the working time of a resource, while the shaded area indicates non-working time (for example, vacation or sickness). Areas highlighted in pale yellow represent on-call shifts. Tapping on the larger orange counter (4) displays a list of not-assigned activities grouped by buckets. Note: This indicator counts only scheduled activities for today (both ordered and not ordered). Tapping on the bucket name will take you to the activity list of the selected bucket. Alternatively, tapping anywhere outside the panel will close it. Tapping on the numbered yellow counter (5) displays a list of not-ordered activities. Tapping the smaller orange counter (6) displays a list of non-scheduled activities. The time-view user menu enables you to configure your user settings and to log out of Oracle Field Service Mobility Cloud Service. Tap the menu icon in the top-left corner of the screen to access the menu. Tap the menu icon or anywhere outside to close the menu. The time-view resource list provides various details about the resources with which you are currently working. A pop-up resource hint displays additional resource details, as well as essential links. The resource photo shows the user for which the current resource is set as the main resource. Note: The user-resource relationship is configured with the main resource property in the Users section of Oracle Field Service Core Manage Cloud Service > Users. If any resources have identical initials, predefined background colors are automatically selected to distinguished them from one another. Resource name: Displayed next to the photo on the right. Resource name will be shown or hidden depending on the width of the screen. Resource status in Oracle Field Service Collaboration Cloud Service: A yellow or green circle in the top left of the resource photo. Green indicates that the resource is online; yellow indicates that the resource is offline. The resource is not associated with any user. That is, no relationship has been set in the main resource property). Note: The Oracle Field Service Collaboration Cloud Service indicator shows the current status of the resource, and is not dependent on the date selected when in the time view. Resource's route status and workload: A circle around the resource photo that indicates the resource's status and workload. The color of the circle indicates the route status for the current day. The length of the circle indicates the resource's workload for the day. A complete circle indicates a 100% load, while no circle indicates that there are no regular activities assigned for the day. The workload indicator reflects only those activities within regular working time and does not factor in any workload within on-call shifts. The workload indicator is subject to browser restrictions: for older browser versions which do not support Scalable Vector Graphics (SVG) image format, the workload indicator will not be shown. This restriction applies, for example, to Internet Explorer 8. Note: Route status reflects the current state, and is not dependent on the date selected on Time View. On-call indicator: A yellow telephone icon in the bottom right of the resource photo indicates that the resource is currently working on-call. Resources using OFSC Mobility or the Mobile application will have the travel time between activities updated using real-time traffic data from the configured map provider. Note: The real-time update is available to users of Oracle Field Service Enterprise Cloud when Oracle Field Service Standard Map Cloud Service with Google Maps or Baidu Maps is part of your subscription. Previous and Next activities include geo-coordinates that were provided by an external system and included with the activity creation. ‘Calculate Travel’ parameter must be enabled for both the activities. To set this parameter, navigate to Configuration, Activity Types, Features. Distance between the activities must be more than 1 km (0.62 miles). ‘Calculate Travel’ parameter must be enabled for the activity type of next activity in the Features section in the Activity Types page. To navigate to this page, click Configuration , select Activity Types. Next activity has resolved coordinates that were provided during activity creation Distance from the current resource position to the next activity must be more than 1 km (0.62 miles). If the resource position is not gathered until the last minute, the coordinates of the current activity are used (if available). If the 'Allow next activity selection on Complete' is enabled for the user where it is possible to select next activity on the route, the travel time to those activities will be updated with current, real-time conditions when another activity is selected. Note: Traffic information will vary based on map providers data availability, which may not be available in all the countries/areas/states/provinces/localities. Check the map provider’s website for data availability. When the traffic data is available, the application uses the most recent information available from the map provider, which may not always be the current information. Field managers can access resource hints that display the name of a resource, the available skills of that resource, and the current day’s working schedule. Resource hints are available on all Oracle Field Service Mobility Cloud Service screens – Manage, Maps, and Calendars. Basic resource information displays when you click a resource’s name. Icons on the hint enable you to access that resource’s route. If you wish to return to a resource’s route that you have already viewed, simply click your name in the upper-right corner of the screen and select the link from the drop-down list. An activity hint displays a summary of information about an activity, including type, name, location, start and end times, and duration. When you click or tap an activity on your route, an activity hint for that activity displays. For more detailed information, click or tap Details to access the Activity details screen. If the activity has resolved coordinates, the hint contains the map showing the activity location. To close the activity hint, click or tap the “X” or on the screen anywhere outside the hint. 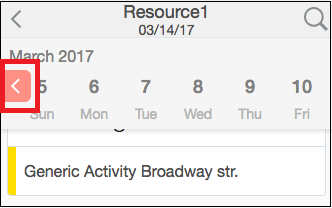 Each resource has three activity pools – scheduled, non-scheduled, and not-ordered. A scheduled activity has a specific date and time. These activities are shown as color-coded bars representing activities of different statuses (1). A not-ordered activity has a specific date, but has no definitive place in the route. These activities are shown as a square with the number of not-ordered activities at the end of your working time (2). A non-scheduled activity has no definitive date and time. These activities shown as a tab with the number of non-scheduled activities at the right edge of the screen (3). You can optimize the processing of non-scheduled activities to improve your mobile app performance. Even if you have large number of non-scheduled activities on the route, only limited number is displayed when you log in to the mobile app. The maximum number of non-scheduled activities to be displayed is set in the 'Mobile activities count' field. To access more non-scheduled activities, you should click the 'View more' link and same limited number of activities configured in the "Mobile activities count' field will be added to the list. In offline mode, you will have access only to those non-scheduled activities that were downloaded to your mobile device before your mobile was offline. 'View more' link is disabled in offline. When any of your activities in the not-ordered pool has an alert, the pool-symbol color changes to red. To display the hint for an activity in the list, click or tap that activity. To close the activity list, click or tap the activity header or on the screen anywhere outside the hint. You can move activities between pools of the same resource, within the route of a resource, and between resources. To move an activity, click or tap and hold it and then drag it to the new destination. When you drag the activity, all possible destinations are outlined with dotted lines and the destination you select is highlighted in green. If your activity move violates any constraints for itself or for other activities, a warning window displays and you will be asked to confirm the move. To close the confirmation window or abort the move, click Don’t Move or tap the “X”. The system still allows you to move the activities despite the warnings. Click Move to proceed with the move or Do Not Move to abort it. The Calendars screen allows field managers to view and update the working, non-working, and on-call time assigned to the resources. 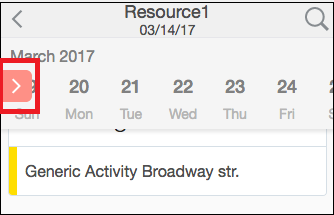 You also can view and edit resource-calendar information for an individual resource by clicking or tapping on their name in time view. The screen is a grid with resource names in the rows and dates in the columns. The screen displays as many columns as it can currently fit subject to size and orientation. When first opened, the screen shows the current date highlighted in red color in the first column. You can scroll left or right to view past or future days by swiping a finger along the screen. As the calendar scrolls, additional columns are loaded. If you want to view the current date without swiping your screen, you can use the red colored arrow present in the date column. If you scroll to view any future date and you want to return to the current date, use the left directional arrow present in the date column. Similarly, if you scroll to any earlier date and you want to return to the current date, use the right directional arrow. The date range displayed on the screen is defined by the business-rules settings in Oracle Field Service Core Manage Cloud Service. Working time is shown in pale turquoise with its duration in a deeper color. On-call working time is shown in white with the yellow telephone “on-call” icon. If a resource has both regular and on-call working time on the same day, the cell is divided into two parts containing information on two different working schedules. Each cell represents the work calendar of the selected resource for the selected day. A cell can correspond to regular working time, on-call working time, a combination of both, or non-working time. If a resource has no schedule on a particular day, the cell is blank. 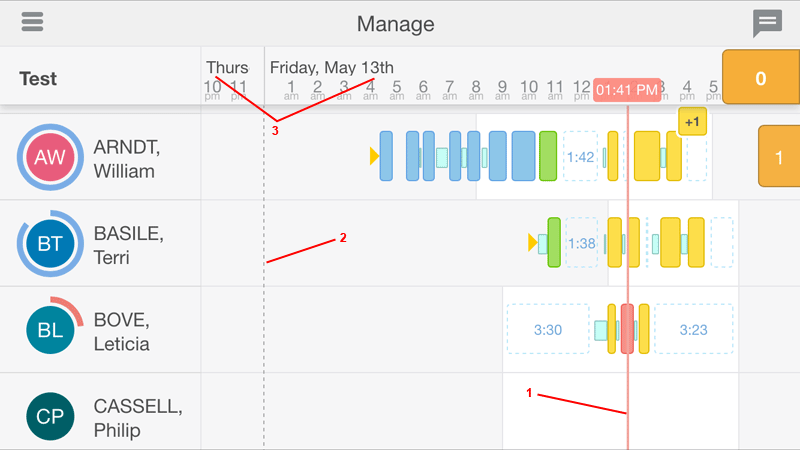 If a resource has overlapping regular and on-call calendars, the regular calendar takes priority and displays the overlap period. The calendar starting earlier is shown first in a cell. Non-working time, such as vacation time, is shown as a blank cell containing the non-working reason. FTE (full-time equivalent; sets the standard duration of a working day, as defined by the full-time equivalent parameter on the Business Rules screen in Oracle Field Service Core Manage Cloud Service. You can select the units of measurement which are the most suitable for your needs by clicking a column header. The column header produces a hint containing all available units of measurement with their equivalent values for the selected column. Note: Changing units of measurement from any column will change them for the entire grid. If they have been pre-loaded, the hint also shows planned working time-values. If no plan has been loaded, the Planned column shows dashes instead of actual values. Otherwise, the planned values display in the units of measurement in which they were loaded, and the hint contains an additional Variance column, which shows the difference between the actual and planned values. A resource list can contain all resources available to a user based on their visibility settings, or it can be filtered to include only those with a specific skill or geographic location. A group is composed of a configurable pool of filtered resources. Configuring a filter and applying it to the selected resources. This is an optional feature that can be used in tandem with manual selection. Selected resources are placed into groups. Each time you log in to Oracle Field Service Cloud Mobility, you will work with one selected group of resources that displays in the resource list on the time-view screen. The name of the selected group appears as the header on top of the list. Resources are sorted alphabetically by name and by their resource ID (PID). In the case of longer resource lists that do not fit on the screen, a vertical scroll bar will help you navigate up and down the list. If there is only one group created for your user, this group is displayed. If there are multiple groups, the group that displays is either the last selected group or the first group in the group list, whichever is applicable. You can switch to a different group if there are multiple groups available. Simply tap on the group header (the group name) to open the Groups window, and then select the group to which you want to switch. In the image, the group with a blue check mark is the one currently selected. Tapping any group name on the list selects group and closes the Groups window. The time-view screen updates to reflect the resource routes in the group you have chosen. To hide the group list, tap anywhere outside the group-list window. You can create a new group, change a group’s details, or delete a group. You can perform almost all group-management tasks from the Groups window. Click or tap on the group header (the group name) to open the Groups window. Click or tap the plus sign in the top right to add a new group by tapping the plus sign . Click or tap the pencil icon associated with the group name to update an existing group . Click or tap the minus sign associated with the group name to delete a group. Click or tap the left angle bracket in the upper left to exit editing mode. Tap anywhere outside the window to close the Groups window. As a user, you can create one or more groups from any resources available to you, subject to your visibility settings. If you haven’t already created any groups, you'll be automatically redirected to the Group Details screen when you log in to Oracle Field Service Mobility Cloud Service. If you already have at least one existing group, you can create a group by adding it to the existing group list. Note: You can add a maximum of 50 resources to a single group. When creating a new group from a bucket/group, only the first 50 resources will be added to that group. You can create a group from any resources available to you, subject to your visibility settings. Click or tap on the group name in the resource list to open the Groups window in time view. Click or tap the plus sign in the top right of the Groups window to switch to the editing mode. Click or tap the pencil icon in the top right to open the Group Details screen. You can configure details of a group using the Group Details screen. Select a filter that will apply to the group. The filter will be used when displaying the members of the group in time view. Note: Go to Configuration > Filters in Oracle Field Service Core Manage Cloud Service to configure the filters that appear in the Filter drop-down list. You must make these filters applicable for the resource entity, and enable the List/Time/Map/Daily check box. Click or tap Edit in the Group Members section to browse the Resource Tree and add resources to the group. , while individual resources are shown by their photos or initials. Select the desired check boxes to add those resources to the group. You can add both group resources and individual resources to the group. When adding a group resource, however, please note that the group resource is a dynamic entity. This means that the child resources within such group resource may change over time, and these changes will naturally reflect in your group content. Therefore, if you want to secure specific resources in your managed group, opt for assigning those resources individually. Selecting a group resource automatically selects all the resources it contains. Click or tap Done to preview your selections. Click or tap Edit if you wish to make more modifications. Click or tap Submit to save the new group, or Discard to delete your changes. If you delete either the last group or the only group in the list, you will be redirected to the Group Details screen to create a new group. If you delete the currently selected group, you will be redirected to the next group in the group list. Click or tap on the group name in the resource list in time view to open the Groups window. Click or tap the pencil icon in the top right of the Groups window to switch to the editing mode. Click or tap the minus sign next to the group you wish to delete. Click or tap Delete to confirm deletion. Click or tap the left angle bracket in the top left to cancel. You can update information about an existing group. Tap on the group name in the resource list in time view to open the Groups window. Tap the pencil icon next to the name of the group to which you want to make changes. The Group Details window opens with all fields pre-populated with existing information. Tap Submit to apply your changes and return to time view. Tap Dismiss to discard the changes and return to time view. 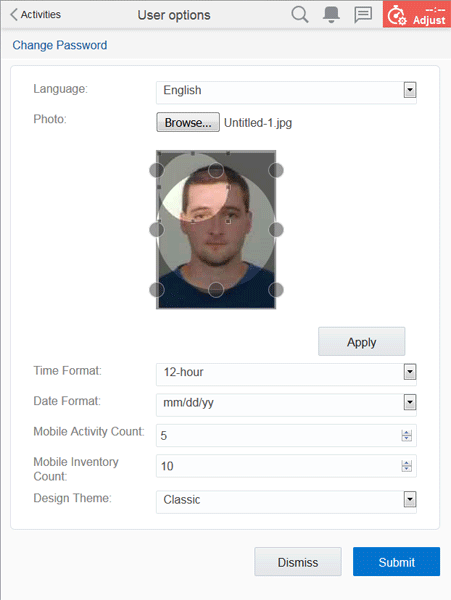 Resources can upload a personal photo to use on the home screen. Field Manager can not upload or modify field resources photo at this place. , and then click Options. (Resource) From your home screen, click Options. Tap Browse to browse to and select the photo you want to upload. After you select the photo, it displays on the User options screen in the editing mode. Drag the edges of the round crop tool to resize and move the area of the photo that you want to select. Tap Apply to preview the cropped photo. Tap Submit to save the photo. Tap Edit to return to editing mode and make additional changes. Tap Dismiss to discard your changes and return to either time view or the Activity List screen.